Arnab Goswami is gifted. You see, he is that species of human kind which develops voice/sound amplifiers on its vocal chords resulting in thundery claps slaps, triggered especially on smelling a rat (smelling, since hearing one squeak is near impossible at his volumes). Goswami’s pharyx, larynx, sharynx combined can hold court sitting atop Qutub Minar, talking down to we the people somewhere on the ground where we belong (especially if we bribed our modem wala Rs. 100 to speed things up, etc). Of course, along with all-just-all politicians, bureaucrats, ministers and their families who he would gladly banish from the Republic of India just like Plato wished the poets away. Why do you look at me in pure disbelief? As if you do not know what's breaking the news these days! So, coming back to my point - Arnab Goswami does not need a microphone. Because Arnab Goswami is gifted. What Arnab Goswami (AG) needs? 1. AG needs to meet Charlie Sheen. Just generally, and not because their favourite shared activity includes threatening-thrashing like teething toddlers! And then, who knows, ‘Anger Management 2’ might find a new hero, especially since Charlie has his real time anger to manage, while AG is usually flaunting his on his courageous panelists – suited booted and on prime time! 2. AG needs to stop using the words ‘scam’, ‘shame’ and ‘suspend’ in the same sentence, more than twice at least. Research shows the three appear, in exactly this order, at least 60 times every hour of Views Hour. English language is full of alternatives, especially when it comes to the letter ‘S’ (some done right are apparently even therapeutic). Fear predictability, AG. Dig those lexicons in the next commercial break and see the difference in your speech, if not your tone. And if Fortune wills it, it might better your waning TRP. 3. AG needs to do some volunteer work, in his free time that is. AG needs to teach Moral Science to the responsible, corruption-free citizens of tomorrow – in the neighbourhood Shishu Mandir. Why? Oh Lord, who better than Me Lord of Papers and Sources who knows what’s wrong with the world and right with himself, who can spell self-righteous in 56 different ways, point his finger in 65 different directions – all without ruffling even a hair on his head. Plus, he’ll be a great hit with the kids. All he’ll need to do is remove his suit and walk into class in his Superman outfit which he never removes from underneath. Isn’t that great? 4. AG needs to take on some endorsements, especially since the usual guys are in-and-out of jails and the advertising industry is suffering. While hair gel (please ignore the picture above) and neck ties have been offered to him already, access to a secret contract that I have a copy of right here tells me that a new brand of Chyawanprash is going to be launched – named ‘AG EnerG’. One spoon a day only can sky rocket your dreams of becoming the human microphone, or next-loudest-thing on TV - hands flying feet stomping, complete. 5. AG needs 3 things, combined, just before his show goes ‘on air’. A glass of lemonade (with real lemons please), a champi with Navratna Tel (thanda thanda cool cool!) and a sprinkle of Nycil, to prevent those bouts of sudden itch springing up in nooks and corners, making him sit as if suspended an inch above his seat and needlessly scratch all those papers in front of him. Only a suggestion, AG, and only because of so much heat! 6. AG needs to eat what Dilli loves to feed – no not butter chicken with butter naan and sirka pyaz. Dilli wants to send him a year’s supply of the "Chill Pill" yaar, absolutely free. Their only condition? That next time he sits on his throne, once, just once he should look at the camera and talk to them. He looks here and then he swivels around to look there and forgets to see the seer in the whole process – the India that is actually sitting at home, waiting to know who is being broken on the news! It’s just a vent for hurt, no more. I heard his voice booming out the TV, on Level G.
And on-and-on he went, orating without me. Have you forgiven me this post, dear AG? It's what ‘India wants to know', and right now, really! 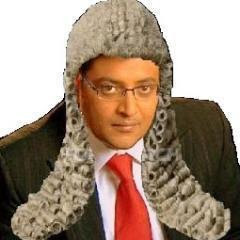 You have used my photoshoped image of "Judge" Arnab without giving me any credit! I am sorry .. All you people here who criticize Arnab are just ignorant of facts . Finally we have a journalist who has the BALLS to ask the tough questions .Every other journalist are putty to politicians . Do you know the life of a journalist? Am sure most of you dont . The number of threat phone calls they get is scary if something is reported on a politician . That's why most of them heed to these people . You need to understand one thing about indian politicians , Every almost everyone of those bastards are corrupt no matter which party it is. Voting for a party here is like choosing to be to be shot to death or being stabbed to death , He may shout , shove his opinions down peoples throats , but he asks the tough questions .And I think in a country like ours ,and with the type of politicians we have ,it is absolutely necessary we have a personality like him on a public platform .He gets answers from them. Even though we not get the answers we want to hear !! He atleast challenges these politicians . I am not saying he is clean himself , who knows after all this is India , But show me one other person who does the job like he does ?? Sometimes truth does hurt ! !